Foreman, Shipwrights, Welder, Crane-boy, Riveter, Heater-boy, Loftsman, Painter, Sheet-metal worker. 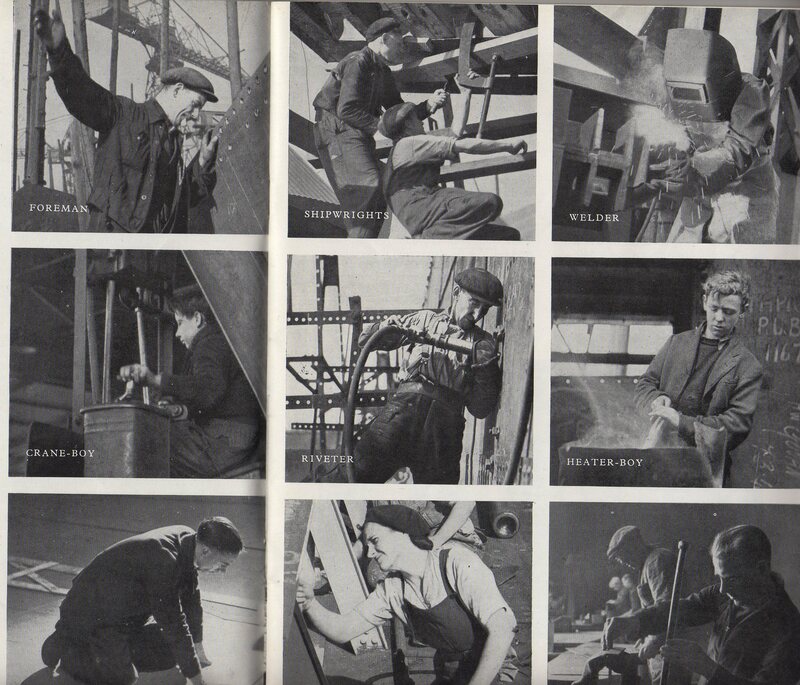 This chapter goes into some of the detail of the jobs and backgrounds of the workers in the shipyards during WWII. The author describes identifying welders by the raggedness of the middle of their dungarees one of whom talks in “a public-school voice” and turns out to be an ex-officer who was wounded and discharged after Dunkirk. The writer is also interested in the Labour Training Centre, some of whom will come out as trained shipyard workers. Inside he sees men and women being trained in the use of machinery; comes across others, whom he describes as “a batch of the brighter ones”, learning about technical design in a more classroom-like setting who will go on to be supervisors; encounters an N.F.S group learning about the upkeep of their vehicles and meets a group of disabled soldiers, one from Tobruk, who are learning to be welders to apprentice standard within three months which would normally take three years, such was the need and the demand. Both the Admiralty and shipyard management were acutely aware of the rationing of labour, particularly of skilled labourers in all industry. So women filled the gaps. Some managers were more positive about this than others, the book quotes one as being jubilant at the prospect saying “They’re more conscientious than the men.” The issue in shipbuilding, however was more of strength, however, women filled jobs where they could, all in the name of the war effort. The author then turns his attention to the filling of skilled jobs such as “shipwrights … platers, frame turners, riveters, welders, carpenters who lay off the templates or patterns, joiners who make the modern equipment which has not yet been swallowed up by the light-metal industry”. He describes the old foreman platers as those who ran their squads like sergeant-majors and considered their inherited craftsmanship a matter of pride. But then, I know that too, from the insights so generously shared with me by those who worked at Robb’s (see here, here and here. Everyone, whatever their position on the yaird when they worked there, was an invaluable part of the whole and as proud of producing good quality work as anyone else. This entry was posted in British War Ships, Henry Robb, plater, Shipbuilding, Shipyards, Tradesmen, WWII and tagged Admiralty, Build the Ships, carpenters, foreman platers, frame turners, inherited craftsmanship, joiners, Labour Training Centre, N.F.S group, platers, quality work, rationing of labour, riveters, Robb’s, shipwrights, shipyard management, shipyard workers, technical design, Voices of Leith Dockers, welders, workers in shipyards, WWII. Bookmark the permalink. Hi im peter! love ur site as my father;his father;possibly his father my father peter (but known as jimmy) jarvie was a plater this is about all i know but would be grateful if anybody knows either my grandfather of same name or my “dad” unfortunately both passed on sometime ago hence my request for any info of them anything at all would help me know what they did in Robbs or even what they were like anywere thank you for your site which in its self was a great help in helping me picture what they done for a living. Thank you for your kind comment Peter, if i find anything out I will let you know. I suspect some of my readers may also have something to contribute to your search as well.